Rihanna has been having quite the love affair with Dana Lorenz’ jewelry lines. Rih wore custom made earrings from Fallon for her Saturday Night Live performance and recently she hit the stage at Peace & Love festival in Sweden wearing a steer ring from Fenton‘s collaboration with Prabal Gurung. 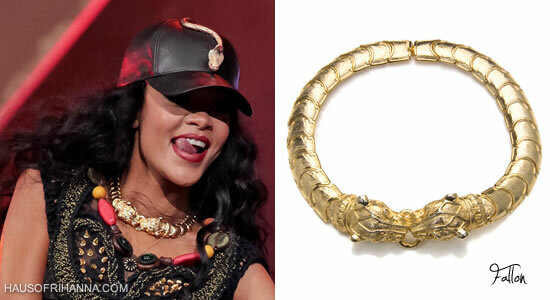 For Wireless Festival Rih opted for Fallon’s gold plated Paulina Panther Choker to complement her custom made outfit. It’s a statement piece that features two panther heads gripping a gold ring. It will be interesting to see if Rih keeps the trend going for other festival dates.